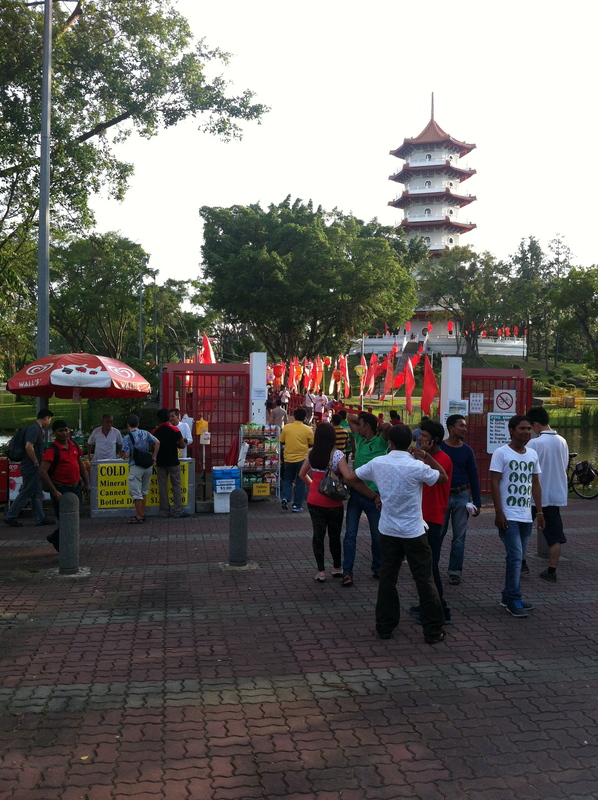 It’s been 8 years since we went to the Chinese Gardens for the mid autumn festival. 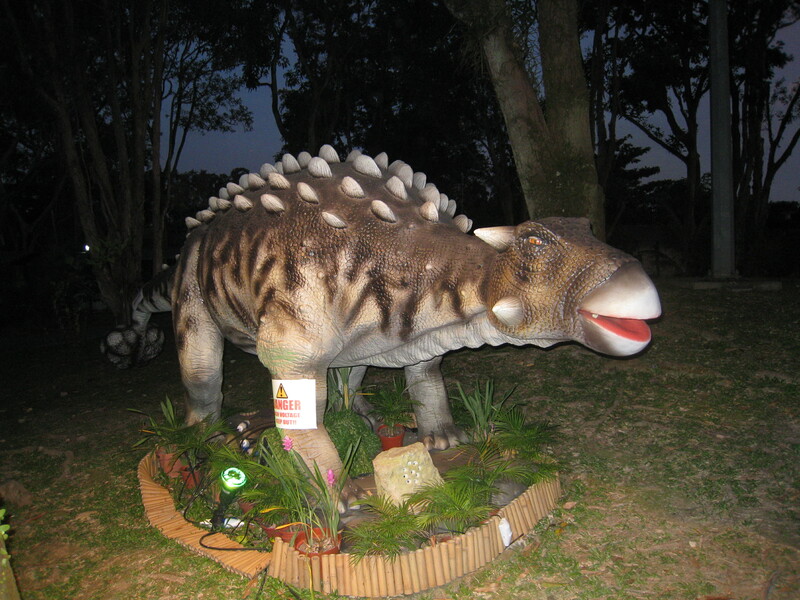 Back in 2005 we were wowed by the lanterns and so looking forward to taking our little ones to experience the Jurassic Safari. The Chinese Gardens are way out west on the green line, so nearly an hour for us on the train. With its own MRT stop it’s easy to find and only a short stroll (on a path fine for pushchairs) through an open field with scratch cricket games and families having picnics. The pagoda sticking up over the trees lets you know you’re heading in the direction and we got to use our new passion cards to get a discount on entry so only $25 for all of us to get in. Unfortunately this is where it all started to go wrong, there are no maps to let you know what was going on so it’s just guess-work. 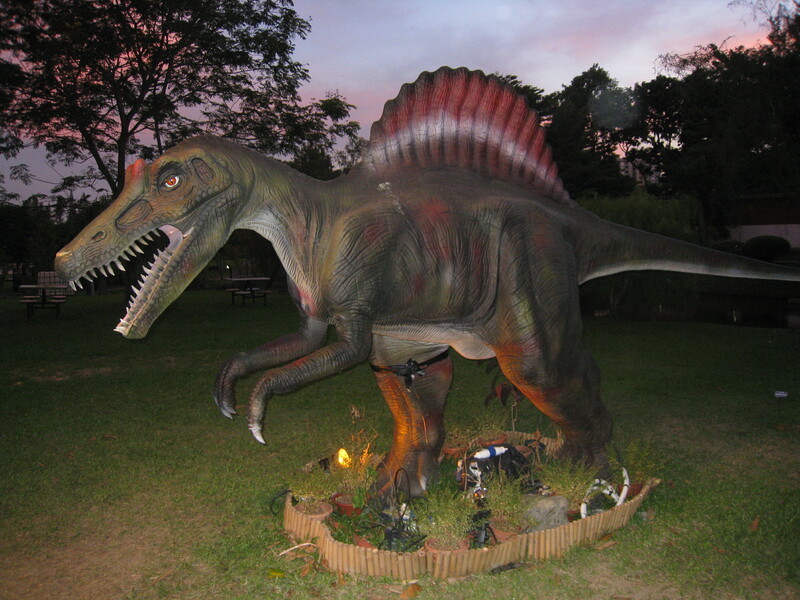 The animatronics were really good and scared our kids with their roars and there was a good range of different dinosaurs. Unfortunately there were no signs to let you know what you were looking at, which meant a good amount of guess-work for dad answering inquisitive little ones. Also next time you want to get there at the beginning of the festival as half the monsters were broken and it’s really easy to see why. Everybody seems to be having photos with their heads in the dinosaurs mouths or hugging them. As you’ll see below this dinosaur had to have his leg bandaged. 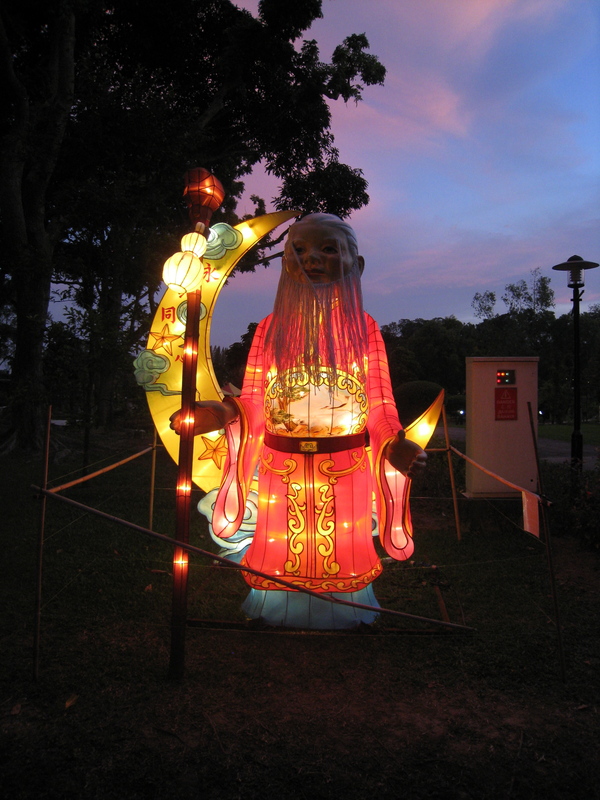 But isn’t the Mid Autumn festival about lanterns? Well that’s what we were really here for and unfortunately it’s that unfortunately word again. Yes there were hundreds of lanterns but there were only 2 lantern statues, which means you get to see them both in this post! All the rest were the small ones hanging from the trees and lampposts. Taking our own Dora lanterns for the kids to carry round was a real hit once it got dark and the people carrying the lanterns around was more fun that the ones in the tress. Not at all there was a show but I’m glad we missed it as the Chinese karaoke kicked off when we were walking past. Much better was the little fairground, they had a train (my kids enjoyed this), helicopter merry-go-round, bouncy castle, knock the cans down and other stalls. We also ate there but will be taking a picnic next time, the noodles and chicken sausage were good but were not sure if we were going to see the fried fish and other bits later. Oh dear not worth the visit? Well it’s finished for this year so you can’t make it anyway. But our kids did really enjoy themselves it’s just such a shame that it could be so much better. Also we had such great memories from last time that it just wasn’t what we were expecting. It’s clear now that the lanterns have moved to Gardens by the Bay and we will definitely be calling in there next year. The dinosaurs were advertised as something special so I don’t think so. That’s a shame. There was definitely more last year when we went, though it’s as you say – Gardens By The Bay maybe taken over. Someone should write to somewhere and suggest that! You’re going to get me writing to the straights times next! Now I have a foolish question: so what where you celebrating? Midautumn? Why (wonders the one who celebrate midsummer… but there is a reason, is there one for Midautumn too)? 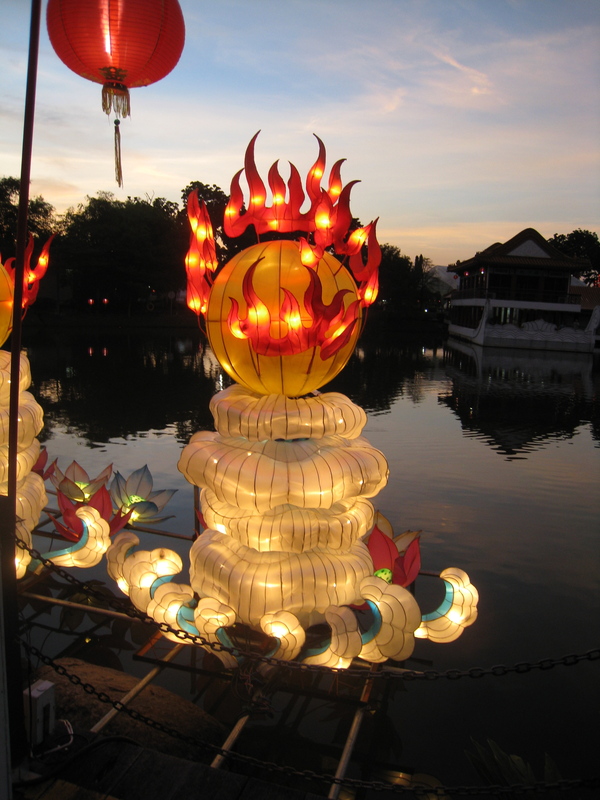 And is there some symbolic meaning to the lanterns or are they just pretty? Shame about it not filling your expectations! Looking forward to learn more about the culture there! Yer I think they have lost their way and that the old big statue lanterns were so much better.